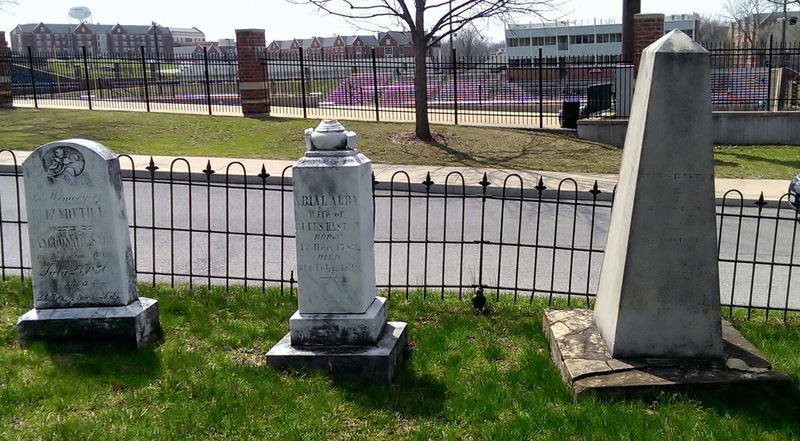 I stumbled across this little cemetery by accident after photographing the Lindenwood University STL250 Cake. I started writing this on a dark and stormy night, but that leading sentence really didn't go very well with the beautiful blue sky and early spring hints of green. Lindenwood University was founded in 1821 by Mary and Charles Silbey, as Linden Wood School for Girls on the grounds of their property. It was called Linden Wood because of the numerous linden trees. 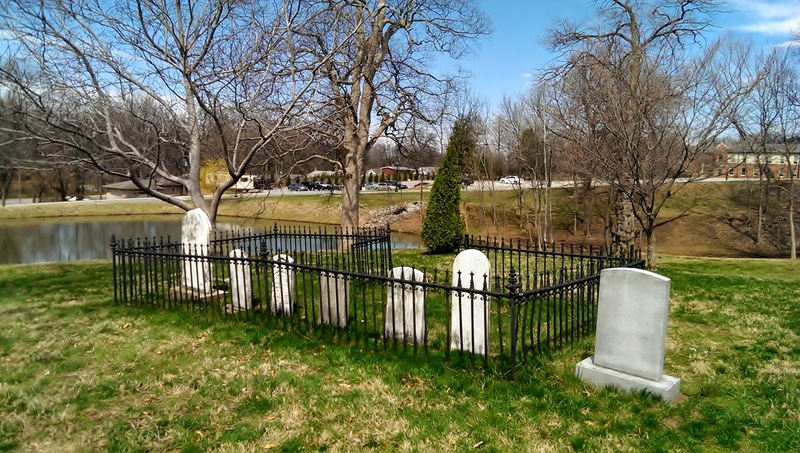 The cemetery is just the family cemetery, from when the grounds were family land. 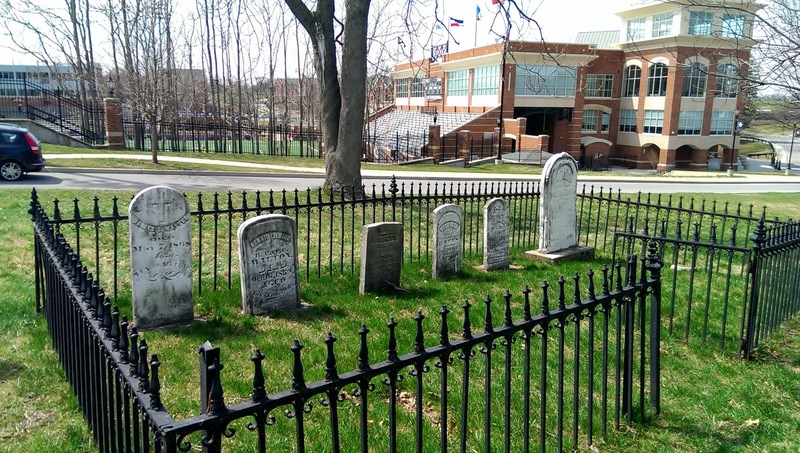 It was surprising to see this as I drove past the athletic field, but I'm glad that they never moved the cemetery. I am not all that familiar with Lindenwood University, myself, but I've always got a "tightknit" vibe from the alumni, so it seems very nice and respectful that the founders are still there. Still there in spirit, too, according to some. There are many stories from people who say they have seen Mary Silbey playing the organ in Silbey Chapel, or pacing the top floor of Silbey Hall. From the stories in this St Louis Post-Dispatch article, it seems like a traditional ghost story that the faculty and students enjoy and consider friendly, like a guardian angel. One thing I found to be very curious is this little section of dogs off to the side. They all seem to be of the same era, but I couldn't find anything about them online. If any current or former faculty or students know about the dogs, or have other stories to share, we'd love to hear them! 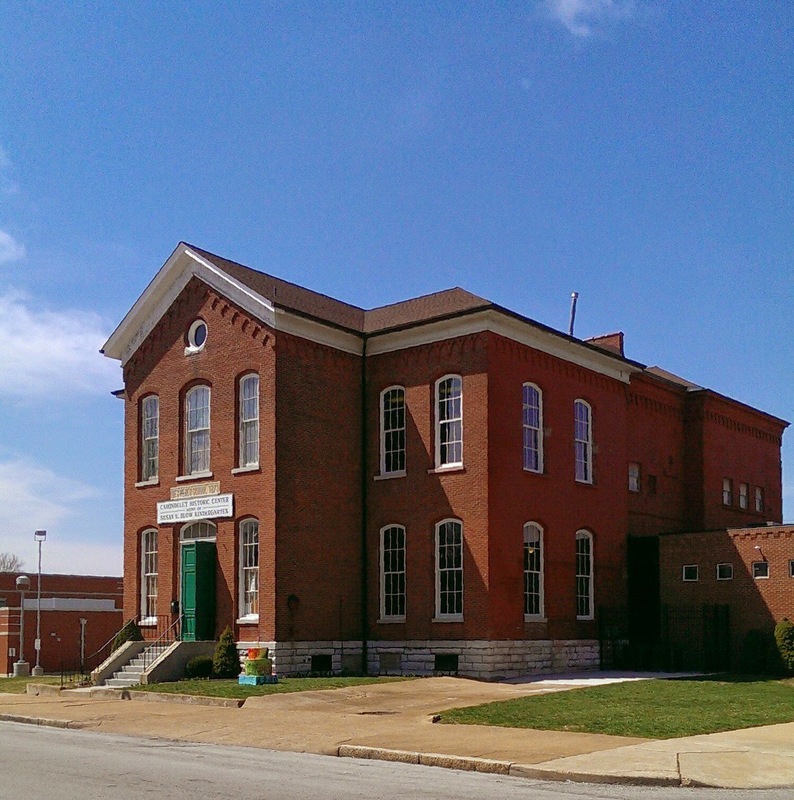 Lindenwood University is located at 209 South Kingshighway in St Charles, MO. Neither here nor there: Wayne Newton will be performing there on May 17. As I mentioned in Part 1, I am obsessed with Cakeway to the West. This is my attempt to catalog all 250 cakes! Years and years ago, I posted about the monument to Big Mound on North Broadway in St Louis, MO. At the time, we lamented the lack of plaque identifying the monument, and wondered if it had been forgotten. 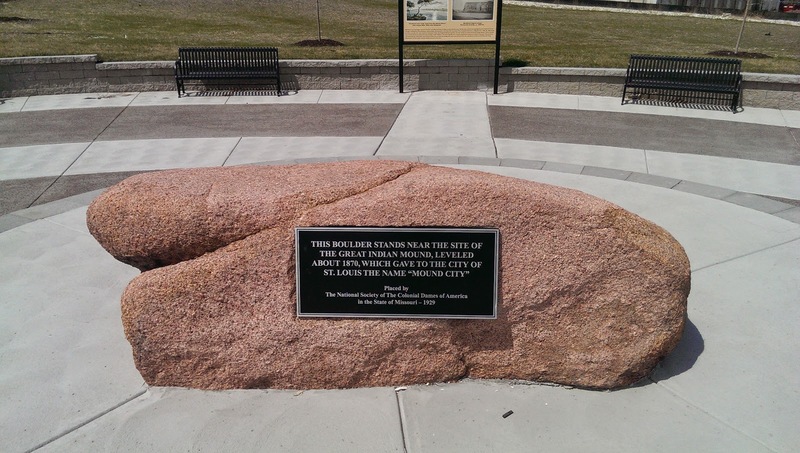 I am happy to report that the Big Mound rock has a new home and is part of a much greater project! When out looking for the Le Grange de Terre (Big Mound) Memorial cake last week, first I pulled up to the old site and had a heart attack, because it is just a pile of bricks with no big rock. 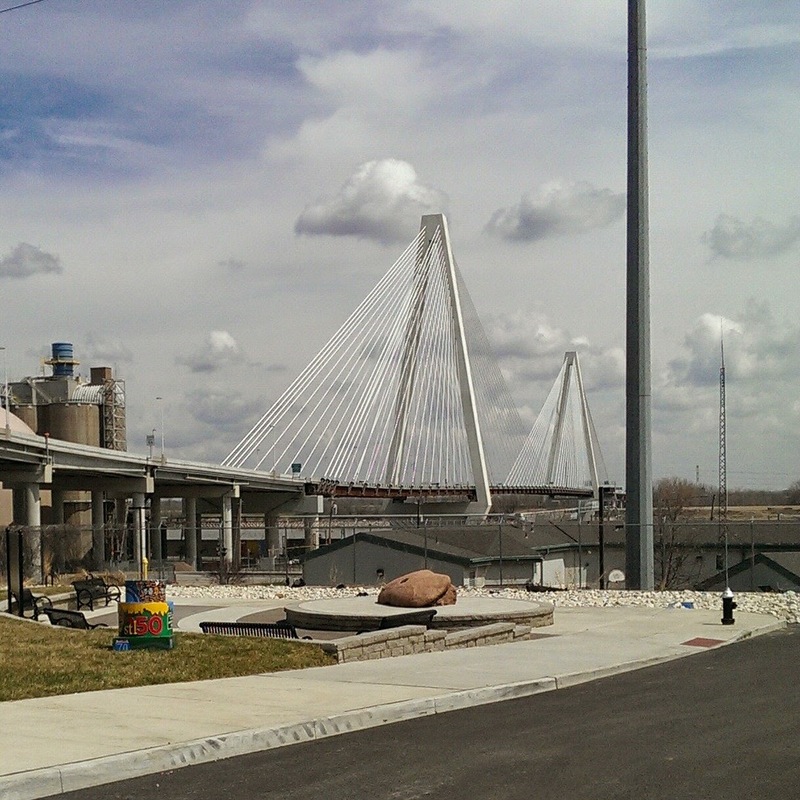 Then I kind of recalled that it had been moved for some reason having to do with the new Stan Musial Veterans Memorial Bridge, and the archaeology project I mentioned in that post from 2010. 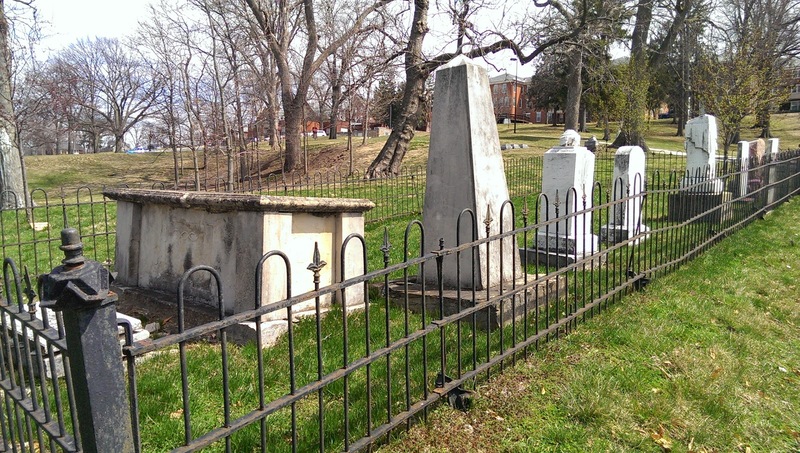 I backtracked to Mound Street, which you see in the first picture, and lo, a new home for Le Grange de Terre Memorial! 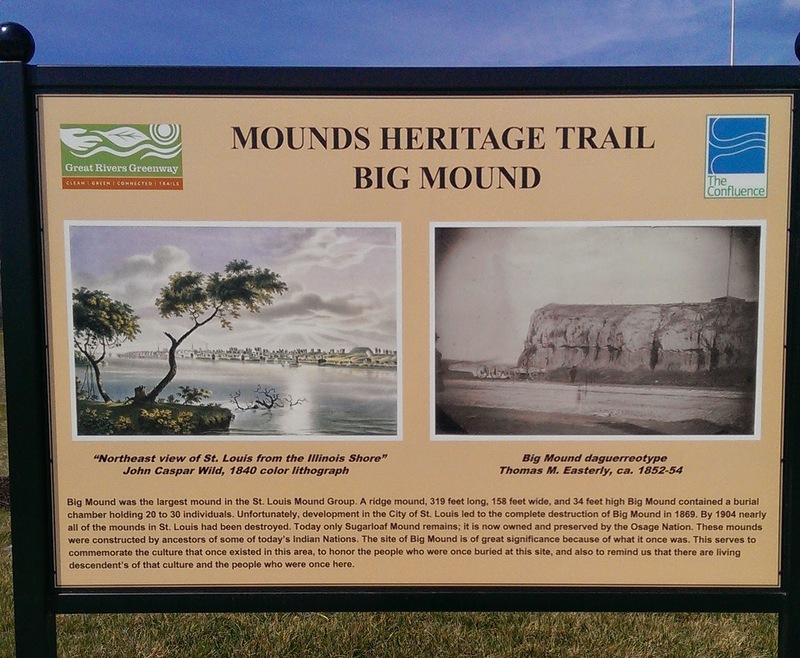 The Mounds Heritage Trail will eventually connect Sugar Loaf Mound in St Louis to the Cahokia Mounds Interpretive Center in Illinois, traveling through various urban & rural points of interest including former mound sites in St Louis and East St Louis. I gathered these details from various news articles from the past 3 years, so if anyone knows of one comprehensive link to trail plans, I would be happy to link to it here! 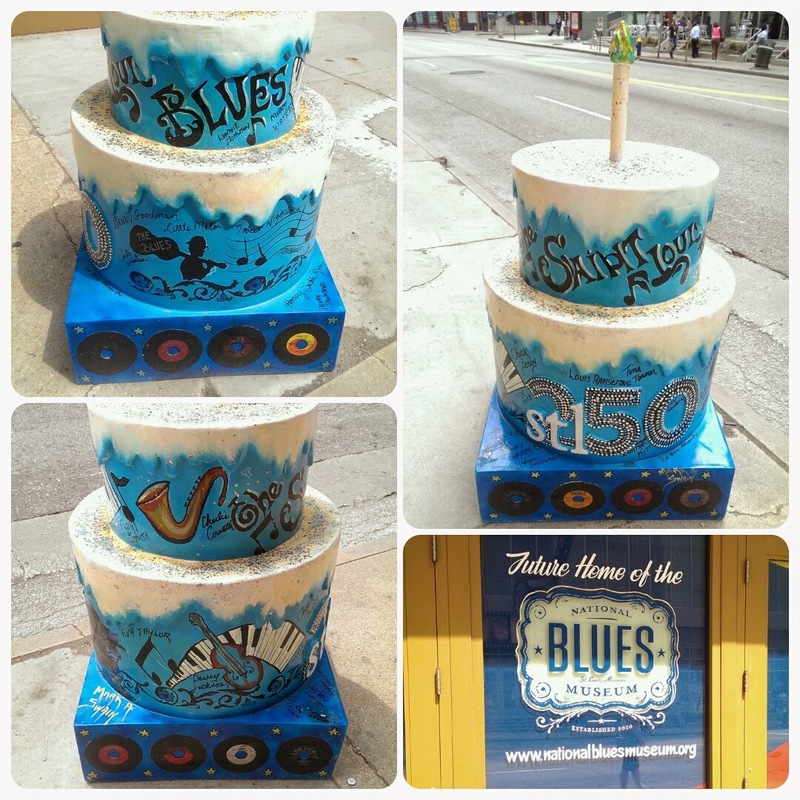 Have you seen the STL250 Cakeway to the West art installation popping up all over St Louis? 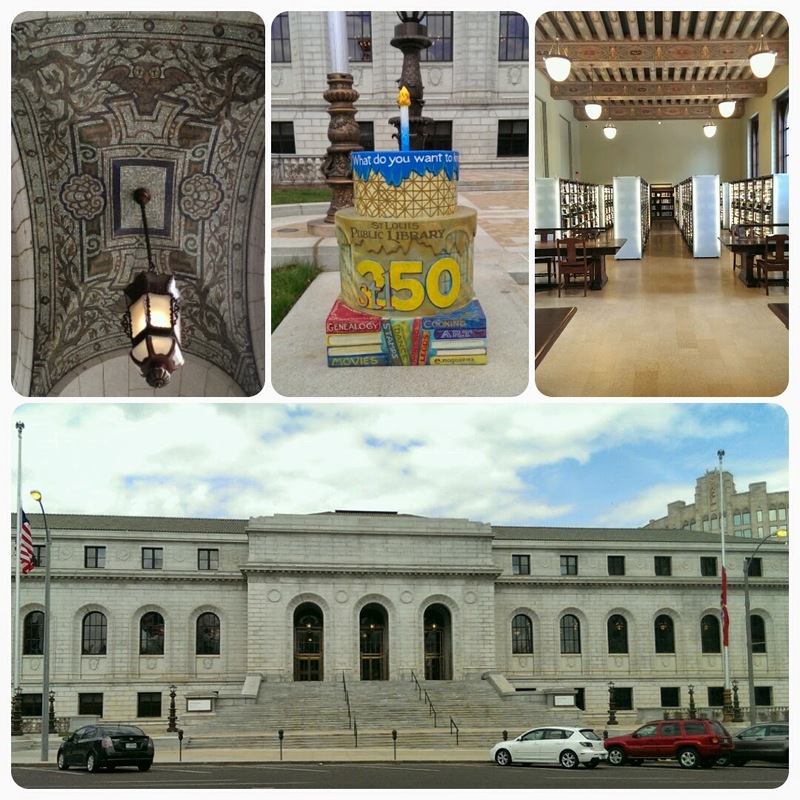 It's St Louis's 250th birthday in 2014, and we're celebrating all year long! 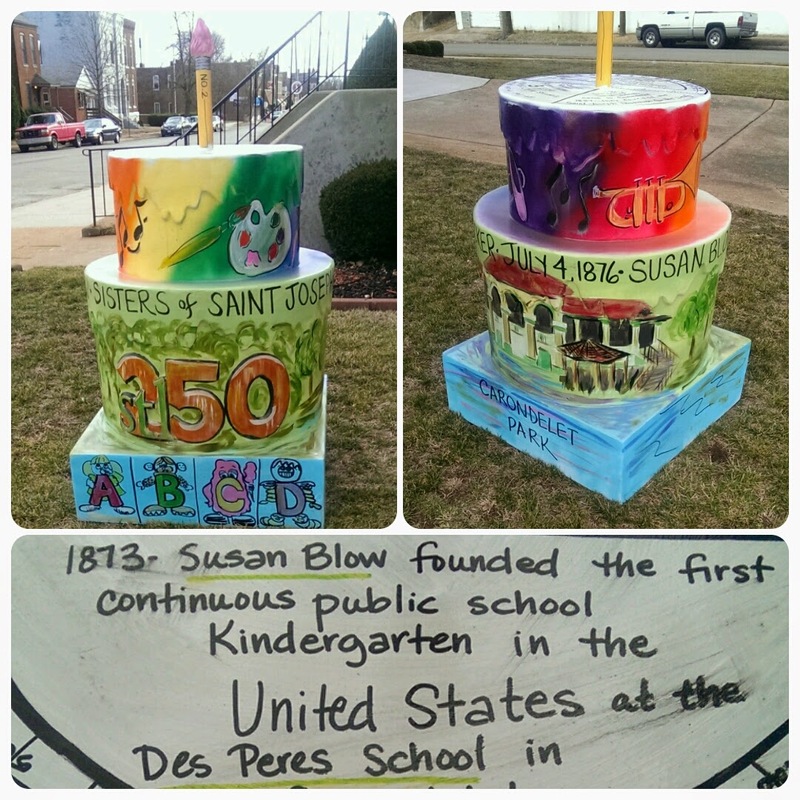 There's a cake right down the street from my house, at the Carondelet Historical Society, which is in the old Des Peres School, where Susan Blow started the very first kindergarten in the United States. Our house is on the old Blow farm. I had some other things scheduled for this week, but when Deanna suggested an April Fools post of silly pictures and outtakes, it was too good to pass up. I hastily put the call out on Facebook for the CC&G Posse's favorite moments from the past 6 years, and here they are, in no particular order. 1. From Bonne Terre Mine in 2010, the only time I've known my husband with any kind of facial hair. It still kind of freaks me out. 2. 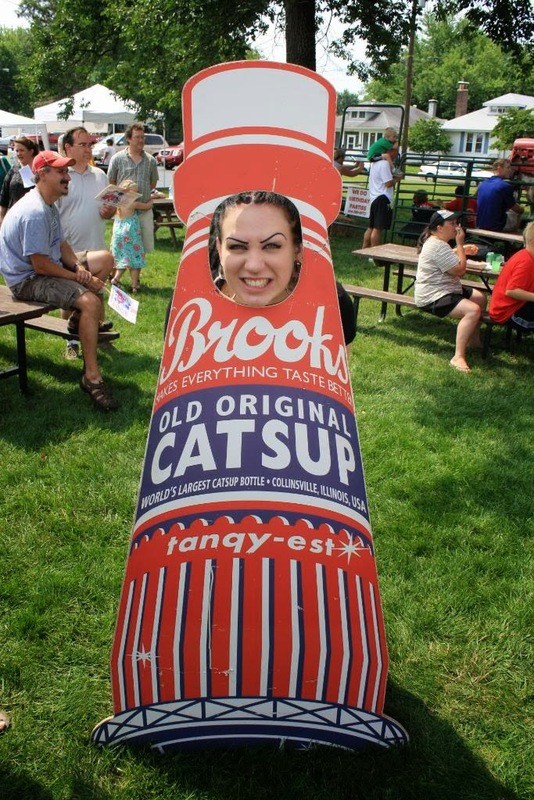 Courtney at the Brooks Catsup Bottle Festival. Courtney, I miss your face! 3. Keith attempts to photograph butterflies in flight at Sophia M Sachs Butterfly House. Also in that entry you can see Jesse with cockroaches and me eating a bug. 4. 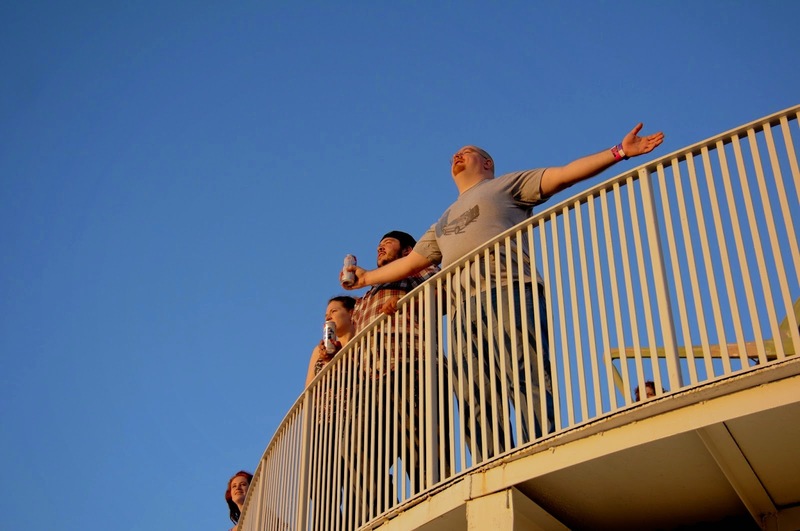 Steve's recreation of Titanic at City Museum at last year's Blogiversary meet up. Which reminds me, it's about time to plan the 2014 party! 5. Charlie attempts to scare Dana in the Chamber of Horrors during the halcyon days (IMO) of Laclede's Landing Wax Museum. 6. 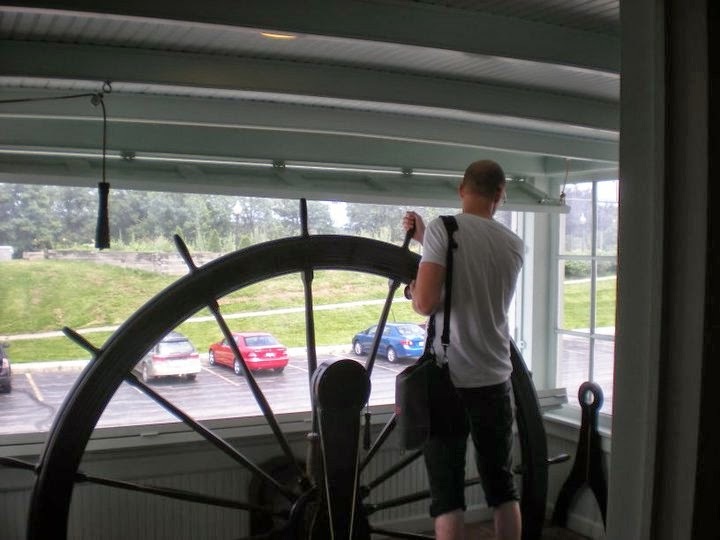 Keith navigates the treacherous sea of parking lot at the Mark Twain Museum & Gallery in Hannibal, MO. 7. The first CC&G Action Cam, where we attempt to film something silly without laughing. This was at the Maple Sugar Festival at Rockwoods Reservation. The tiny pancakes picture is still one of my favorites on my moo cards. 8. 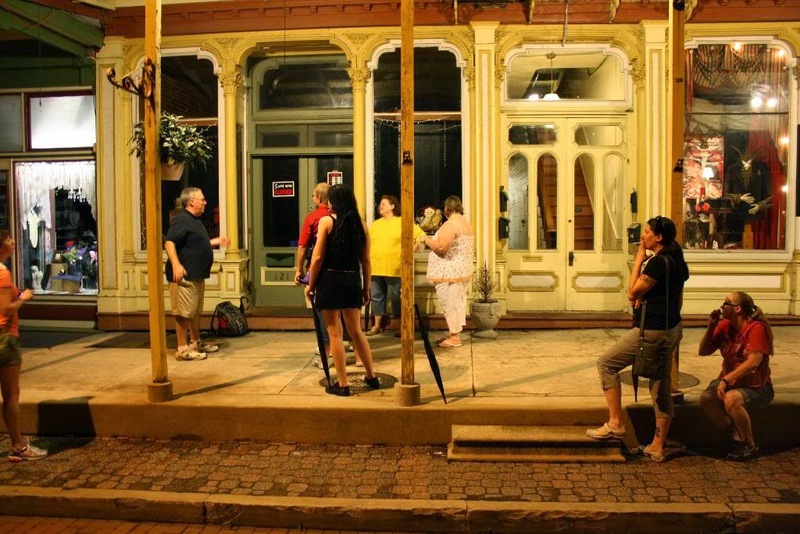 Ghost Hunting in Lebanon, IL. I've always found this picture amusing because of the "behind the scenes" quality. 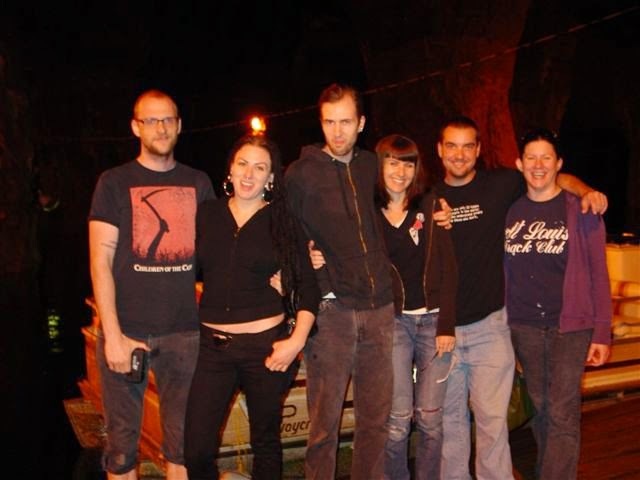 Also, high five to Amy on us quitting smoking since this picture was taken!